Have you made your New Year’s Resolution to eat healthier? We have, and since it is only January, we have not yet lost our resolve. Listed below is a delicious recipe that we have both been enjoying: Mustard-Maple Roasted Salmon 2 TBSP Dijon Mustard 2 TBSP Finely Chopped Fresh Cilantro 1 TBSP Light Mayonnaise 2 TSP Pure Maple Syrup 4 – 5 Oz. Skinless Center Cut Salmon Filets Kosher Salt and Freshly Ground Black Pepper Preheat the oven to 400 degrees F. Line a rimmed baking sheet with aluminum foil. Mix together the mustard, 1 TSP of the cilantro, the mayo and maple syrup in a bowl. 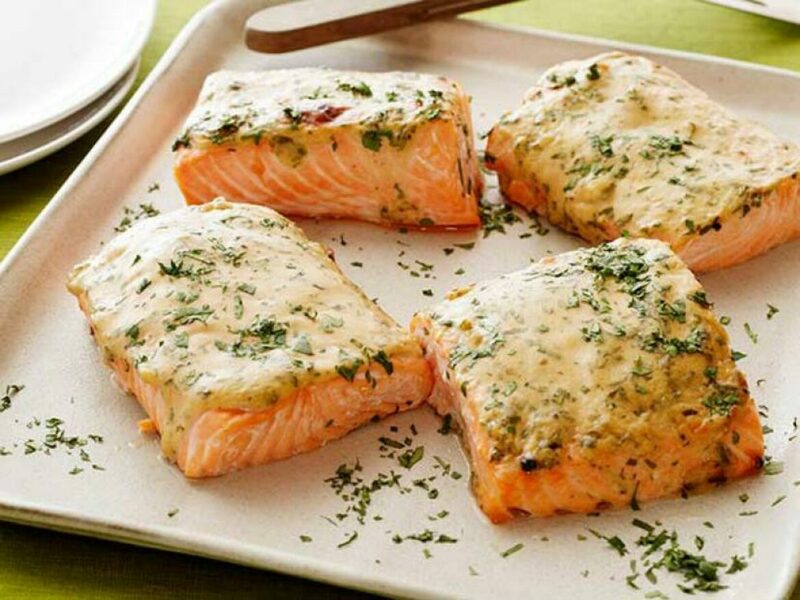 Put the salmon filets on the baking sheet and sprinkle with ¼ Tsp each salt and pepper. Spread some of the mustard mixture evenly over each fillet. Bake until just cooked through, 10 – 12 minutes. Sprinkle with remaining 1 TSP cilantro and enjoy.